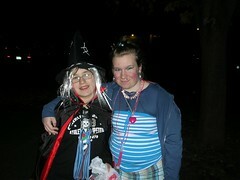 The weather was perfect for trick-or-treating - dry and not very cold. Parents came out with their little ones and there were some cute costumes, none of which are pictured. Oh well. 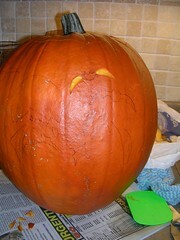 This was my first attempt at a scene on a pumpkin - not bad but not brilliant. It's a bat beside the moon with three little bats in the background. This is my usual pumpkin face. Not too scary this year. Two sisters in the immediate 'hood. Don't be fooled by the makeup - they are good kids. 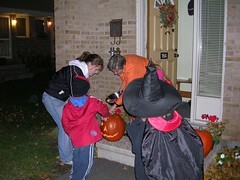 The only action shot of kids at the door and me handing out treats. Note the skeleton earrings Mum. 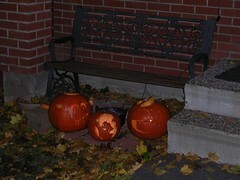 Someone else had done a nice job with glowing pumpkins - the photo doesn't do them justice. I think I will be taking candy to school tomorrow! 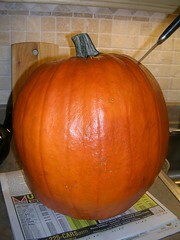 Blogging is light today because I have set myself the task of carving a moderately intricate pumpkin. However, my right (knife) hand has a bit of a cramp so I pause in carving to blog. We got two nice sized pumpkins and this is the smaller one. Some weeks (or should I say months) ago, Loblaws started to get in their Halloween stuff and I spotted this booklet of templates. 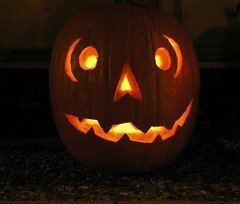 I usually make a face on my pumpkin and I have got good at not carving all the way through the flesh so it glows nicely. But I have wanted to so something more intricate and I liked some of these motifs. 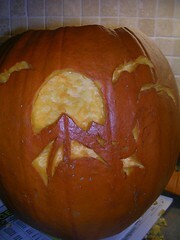 For this pumpkin, I chose the one with bats and a moon. Why did I not draw one myself? To much work. 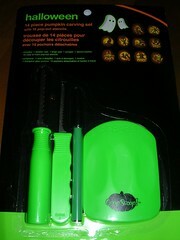 The set comes with two carving tools but they are tiny saws and their purpose is to cut all the way through the flesh and to get the proper effect, you don't cut all the way through. As I said, I bought the kit for the templates. After cutting the lid out and scraping out the guts, I draw on the template and make my first cuts. The one tool that came with the kit that was great, was the gut-scraping tool. I have always used a large soup spoon but this plastic scraper works much better. I also cut a small vent hole in the back of the lid area to allow oxygen in for the candle later. I discover that making this intricate pattern is quite fussy, and no, I am not surprised. I have to be very picky in ferreting out the tiny bits of flesh. For the moon however, I have discovered the perfect tool - a serrated grapefruit spoon! 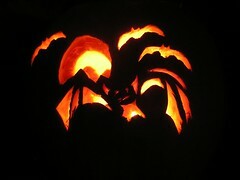 More pix will follow tomorrow, with the pumpkins lit and all. 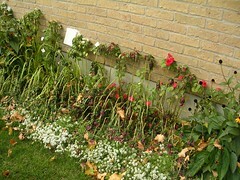 In the meantime, this is what happens to impatiens after the first frost hits. I shall have to dig all this out this week, in order to get it in the yard waste pick up day time slot, which is this Friday. 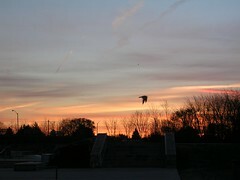 "Red sky in morning, sailors take warning." It's not very red and they are only calling for a chance of showers. Here's that can again, this time as flat as a crushed can. Still in the same parking spot, however. 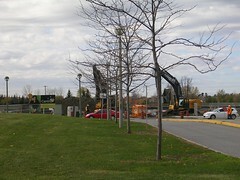 The construction continues apace. 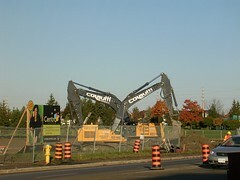 Big piles of dirt, machinery rumbling, traffic being flagged. 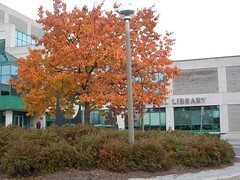 I took this photo standing halfway between the Marshy's mini-mall and the old Nepean city hall. 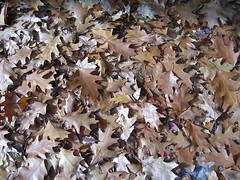 Just a few days ago, I took a photo of this oak tree and it had a lot more leaves. This is where they all went. I thought today would be pretty slim pickings, being Sunday and with nothing planned. 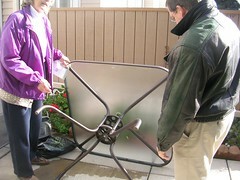 But things started to happen when a neighbour asked if Peter could help her with dismantling her patio table so she could get it into her basement for the Winter. I haven't even cleaned out the garage to make a spot for our table, much less dismantled the garden and planted the bulbs. But it was a nice sunny day even if it was only 5C so we went over to see what we could do and ended up taking only a few minutes to take the table apart and move it into her basement. With that chore done, we headed out to see what there was to see. 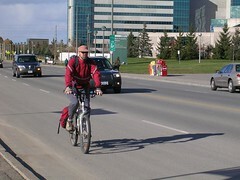 A hardy cyclist pedaled by on Centrepointe. It really wasn't that cold and anything above zero is a bonus. 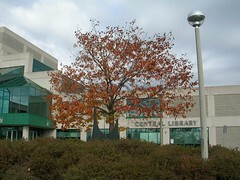 We waved hello to all our blog readers. 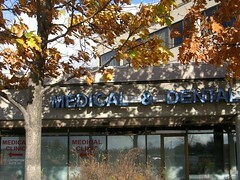 The wind was blowing the dried and nearly gone leaves in front of the medical centre at the little plaza whose name we realized we do not know. 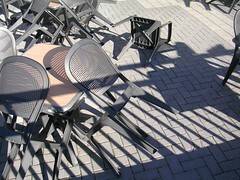 And the wind had blown over a chair at the Marshy's patio, signalling the end of patio season in Ottawa. Yesterday after work, we dropped by Marshy's for a drink and to do the crossword puzzle. There is a small group of puzzlers who gather regularly at Marshy's and we partly compete and partly share answers, depending on how hard the puzzle is that day, which paper it is in, and who shows up. I bring over the one I clipped from the Citizen and Marshy's gets several copies of the Sun, so often we do both. 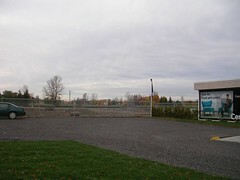 We discovered that Brad Marsh has just started the Brad Marsh Bar BQ & Grille "Great Prize Give Away" this week and the first prize was being drawn that very afternoon. 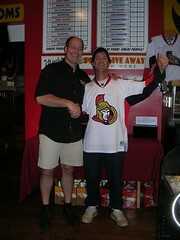 Every week, Brad will draw a ballot for a Senator's jersey and less often, he will draw for more expensive prizes. I put my ballot in the box for the Grey Cup tickets. Then Brad asked me to pull the winner from the jersey box and I chanced to draw Darren Boyd's entry. I don't know Darren but when he accepted his jersey, he proclaimed that he was the Zamboni driver at the Merivale Arena, so that's what I am reporting. Anyway, it was fun and he seemed pleased. In case anyone was wondering, it was 16C that afternoon and therefore, Brad was wearing shorts. I, however, was not. 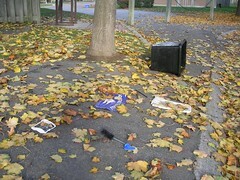 On the way to Marshy's, I stopped to take a photo of the debris remaining from Friday morning's garbage pick up. Oftentimes, the crows and squirrels have managed to pick things out of the bags and then leave the paper and other inedibles behind. 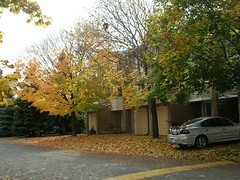 In the spots where more than one household deposits its bags and boxes, there is usually a concentration of these leavings. Today however, I noticed that the debris was made up of the stuff that remained from last week! I sometimes get tired of looking at the garbage lying there, day after day, and so I pick it up. 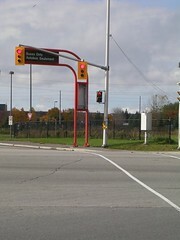 This week, I didn't and it was still there after the second garbage pick up. 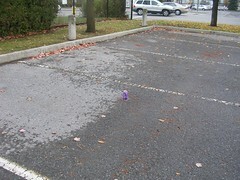 You'd think that the person whose garbage it was in the first place might recognize it and pick it up him or herself. Or not. 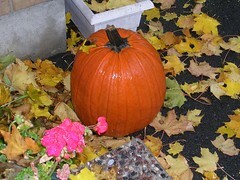 This morning, it was raining steadily and Peter thought the pumpkin at the front door looked nice in the light. Later, the rain let up and I went for a walk. 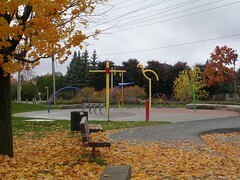 In spite of it being a damp day, people still like to get together and do something outdoors. This group was just finishing a game of frisbee football and it looked like they had had a great time. Rounding the next bend in the path, I came across a red squirrel who ran up a tree and then stopped to shake his tail and scold me. We don't have many red squirrels compared with grey and black ones so it was a treat to stand and watch him until he ran up the tree and out of sight. 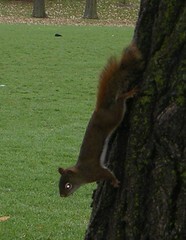 While I was trying to get as close as possible to the red squirrel, I noticed this thing on the ground. 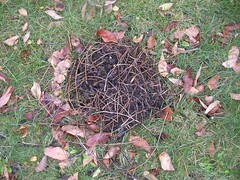 It might have been a nest but I didn't want to examine it too closely for fear of bugs or things more squidgey than that. Heading across the parking lot for the park, I was reminded that, as far as I recall, the two outbuildings have never been in use in all the time that we have lived here, which is more than ten years. They may house washrooms and maybe no one wants the responsibility of maintaining them but I don't know for sure. 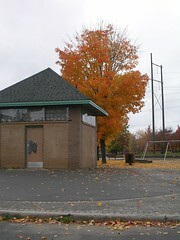 This is a very cute water "park' for the kids in the 'hood - obviously closed for the winter. On the way back, the sun came out and I wanted to capture the contrast between the dark sky in the east and the lit leaves in the foreground. Sometimes, it's better to be there. And even if I made a little movie with the sound of the geese coming in for a landing, as they were then, you would completely miss the smell of the wet larch needles that completed the effect. 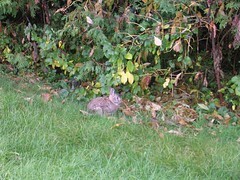 Finally, just as I was about to turn out of the park and into my own 'hood, I saw a bunny! As soon as I snapped his picture, he bolted around the end of the hedge and completely disappeared. 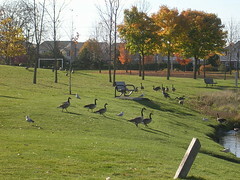 I took most of these pix yesterday but the geese were still there today, pausing in their exodus to warmer climes. 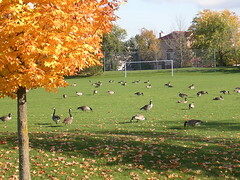 I've seen them more densely populating the soccer pitches but you take what you can get in the way of snap shots. Here, they are walking toward the pond for a refreshing dip, after eating all that grass. 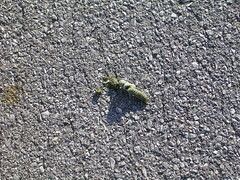 And here is what they left behind on the pavement. Again, this sort of thing has been more densely represented but I couldn't find a spot where there were more than one of the little logs of poo without backing up enough so that they then wouldn't be in close-up. The poo logs are generally bigger than one of my fingers. 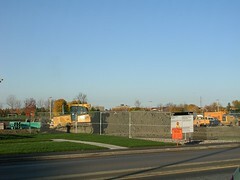 This is the construction site from the west side, looking east toward Marshy's. 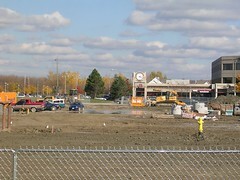 You can see the fire hydrants and there are different kinds of pipe piled up. They have also installed storm sewers. 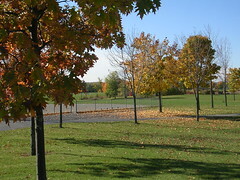 I thought this was just pretty, with the leaves scattered on the ground and some stuck to the fence. 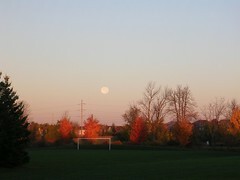 This is what the moon looked like at 7:47 am this morning. 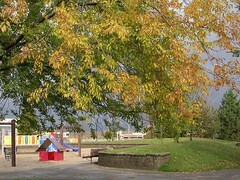 That's the north west sky in the Centrepointe Park. Today is St. Crispin's Day and for a thrill, you should go read Shakespeare's inspirational speech from Henry V. "But we in it shall be remembered - We few, we happy few, we band of brothers." 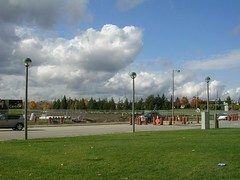 The construction site is still mostly at the dirt-moving stage. Dig big holes. Move dirt around. 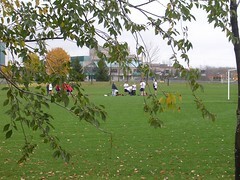 They are also assembling pipes of various sizes and colours on the field. I think these are called high hoes and I liked the way they complimented each other from my perspective. Later on, I saw one of the high hoes being used like a crane to lower concrete pipe sections into the big hole in the middle of Centrepointe. 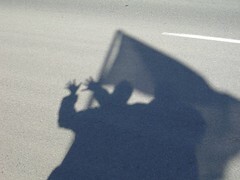 This time, they had a flag crew stopping traffic and only allowing one lane to proceed at a time. 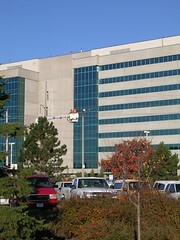 These two guys were perched way up in a bucket, doing something with one of the high light standards along the bike path. And today is yard maintenance day in the 'hood. 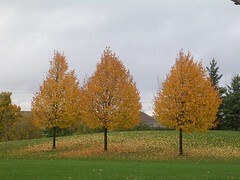 No lawn mowing here from the look of it, but plenty of loud leaf blowing. 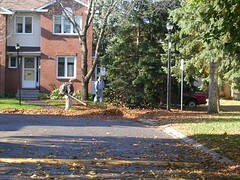 But when you want to move a lot of leaves in a hurry and off different surfaces, this is the way to go. 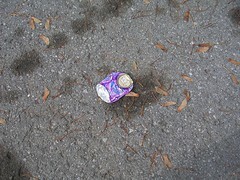 I often wonder when I see something like this can, standing upright in a parking lot. Did the owner put it on the ground while getting in the car, only to forget it and drive off? I've done that, with things on the roof too! It was still there when I walked home after 1 pm, but then it was lying on its side. 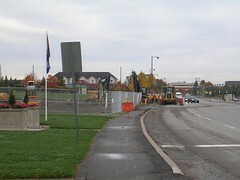 It was after 8:30 am when I walked by the construction site and nothing was happening behind the fence. But when I turned and looked north, I saw that the sidewalk and the west lane were blocked. On the way home, the blockage had moved to the middle of the road and cars were driving around the obstruction on either side. This is the corner kitty-corner to the last one. 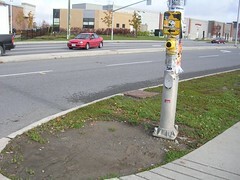 There, at least the pole is right beside the pavement. However, in the winter, snow gets piled up against the pole and eventually, a pedestrian cannot reach the Walk button unless she climbs up the snow pile. Wait for pictures in months to come. Finally, as I was crossing in the Castlebrook Village from Plunkett, I thought the fallen leaves looked awfully pretty, blanketing the ground like that.